The perfect training infant divided plates for your little angel because let's face it, sometimes feeding a child can be a messy job. The last thing a parent wants is a spill and mess to clean up. Baby product brand Avanchy is proud to announce the launch of their solution to this problem, the Avanchy infant Suction Plate that is safe, fun and attractive! 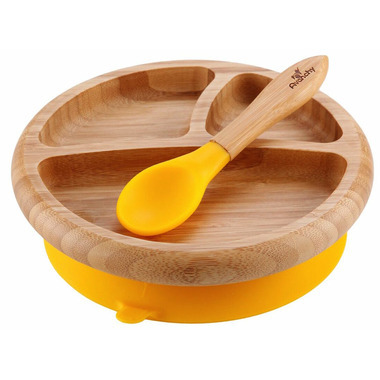 Lightweight, no-slip, beautiful bamboo baby plate is the solution for cleaner, splash-free meals. Press the Airtight-Lock mechanism onto the table and the play will stay in place. 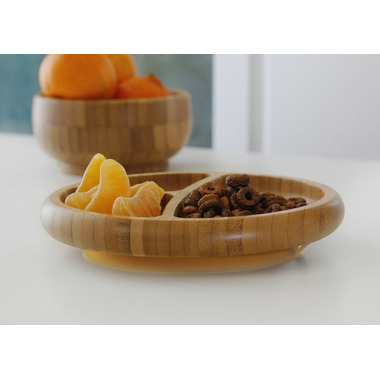 Split into three compartments for more convenience. The product is beautiful, but the suction only sticks for around 30 seconds, then slowly releases. I agree with the other commenter, plate is too shallow and really just small in general which you can't tell in the picture. My baby is also able to unstuck the bowl no matter how carefully I place the suction and making sure the tab is away from her so she doesn't accidentally pull on it. It's a really beautiful product, but I think I'll try those ezpz Mats instead.